At Derwen you will experience real work situations with appropriate levels of support. As a new student you will have taught sessions in your chosen pathway area. When your confidence, experience and skills increase, internal work placements will be included in your timetable. You will experience a range of internal work opportunities within your chosen pathway area and the operational and commercial outlets in college. As in your taught sessions, you will work towards your individual objectives and targets set by your Programme Manager. Towards the end of your programme you will start to work with the Work Placements and Transition team, who will arrange a suitable external work placement for you. External placements are arranged by the Work Experience Coordinator and are linked to your pathway area: either in one of our satellite sites or within the local community. You will generally have completed a Health and Safety Certificate and, if applicable, a Food Safety Certificate prior to starting an external placement in the community. External placements are generally accessed in the third year but exceptions have been made if a learner is excelling. The Work Placements Team have received the Fair Train gold quality standard award for the outstanding work that they do. The team have well-established contacts with a wide range of providers in Oswestry and the surrounding area. These include national chains as well as local libraries, catering establishments and shops. Where appropriate work opportunities can be linked to your home area. We have a close working relationship with Premier Inn. 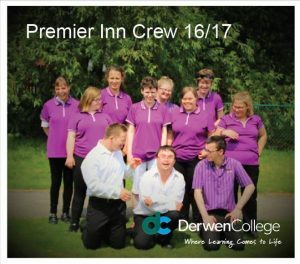 Together with Novus Solutions, Premier Inn opened a training hotel at Derwen College in early 2017. As a student on the Hospitality and Housekeeping pathway, you will have the opportunity to train in the training hotel. Click here for more information on the latest Premier Inn Training Centre. We also have a very successful partnership with Severn Dee Travel at Gobowen where Derwen College run the The Station Café. This provides an invaluable work opportunity for students working in a busy café environment. During your final two terms at Derwen College the Transition Coordinator will work with you and your parents/guardians to look for work opportunities in your home area. This process will usually be discussed during your first review meeting. We can then ensure you have access to learning opportunities relevant to the type of work you would like to do when leave college. If you wish to undertake a work placement in your home area during the college holidays, the Transition Coordinator will liaise with your local careers adviser to assess feasibility and assist in making the necessary arrangements. Please let us know if you already have a work placement or paid employment. We will endeavour to continue the placement where appropriate. Click this link to read about some of the positive outcomes our students and trainees have had through work placements.